By now everyone is aware of what happened between Legia Warsaw and Celtic, if you don’t know than you must have been living under a rock for the past week, but since I am a giver I will give you a snippet of what happened. 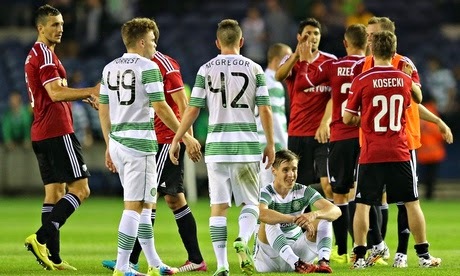 Legia had defeated Celtic 6-1 on aggregate in the third qualifying round, and it was discovered that Legia had fielded an ineligible player. Bartosz Bereszynski came in as a substitute in the final three minutes of the second leg in Glasgow, and was not allowed to be on the field due to a suspension. The Legia 2-0 win was scrapped and Celtic was given a 3-0 home win instead, based on the rules of the competition that state that a team that fields an ineligible player forfeits the match and the opposing team is rewarded with a 3-0 victory. This meant that Celtic advances on a 4-4 aggregate with a goal scored in Poland being the tie breaker. You are following it so far? Great, we could now debate or even argue the fairness of this rule and how it hurts the game of football and all this other garbage I read in many online blogs and forums. Since this is not a debate I will just give you my viewpoint and will allow you to comment in the section below. This is the rule, anything beyond that and you will forfeit the right to make any further comments. It is time to focus on this game and the rule that has people in an uproar. The rule may be absurd in this context of a player coming in for 3 minutes and having no impact in the result, but when an organization sets out to organize a competition, it creates rules that all participants are aware off, and it does it with the point of providing a fair starting point for all of those competing in said competition. It doesn’t look at specifics of when a player came in or did not have impact in the game; those details are irrelevant and could become murky given the individual interpretation of the law. So it creates an easy to understand rule. A player that is illegible to play can’t play; if he does his team will forfeit the game resulting in a 3-0 loss. That is easy enough to understand; even a 10 year old could grasp that concept. For those suggesting that a blind eye should be turned towards this issue, you are suggestion anarchy and more corruption to a system that is already impregnated with corrupt people. It would be like saying that a player that saw a second yellow in a competition semifinal and therefore missed the final should be forgiven that card, because he did it when he took his shirt off in the 90+3 minute of the game and was doing it in celebration, his emotions got the best of him. While possibly true, the rule is there and should be followed by all, regardless of how stupid or idiotic the rule is. If the clubs participating in the competition find the rule unfair and idiotic, than they can lobby the organizers to have the rule changed or rectified, but never with retroactive consequences. Now the real loser in all of this is the poor team official that made the mistake and included the name of the excluded player on the team sheet, allowing the coach to make a mistake and use him for the last 3 minutes of the match. Her name is Marta Ostrowska and she is now receiving death threats from the Legia supporters. She has been advised to take her family and leave Warsaw until the situation cools down. I hope that nothing happens to her or her family, she made a mistake and I am sure she is living with the consequences of her actions. We all make mistakes and nothing she has done deserves the pain and suffering she is being put through.